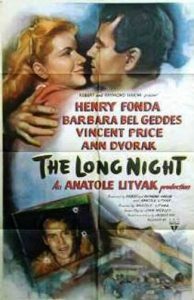 An exciting rediscovery from the studio vaults, The Long Night is an emotionally gripping, visually dynamic film noir, in which Henry Fonda, at the peak of his career, delivers an unforgettable performance. Presented in an intricate web of flashbacks, The Long Night follows the fractured thoughts of Joe Adams (Henry Fonda), a factory worker pinned inside his third-floor apartment after gunning down a mysterious, dapper gentleman (Vincent Price). Joe’s memories (often containing flashbacks within flashbacks) reconstruct the events leading up to the shooting, revealing his romance with a quiet young girl (Barbara Bel Geddes), his less romantic involvement with an emotionally calloused showgirl (Ann Dvorak), and the varied twists of fate that drove Joe to murder. In staging this remake of Marcel Carne’s Le Jour se leve (France, 1939), the producers of The Long Night imported not only the story but the look of poetic realism that made the original so haunting. Production designer Eugene Lourie and cinematographer Sol Polito created a shadowy wonderland, recreating broad exteriors in the controlled environment of the studio, replete with enormous sets, miniature factories and some ingenious cases of visual sleight-of-hand. At once dismal and magical, the world of The Long Night is unlike anything Hollywood had yet imagined, and laid the groundwork for the dark and gritty (but highly stylized) imagery that became the hallmark of film noir. Film debut of Barbara Bel Geddes.